Kotor passenger and car ferry ticket prices, timetables, ticket reservations and information for ferries sailing from Kotor to Montenegro and Bari. Compare all available Kotor ferry ticket prices in real time and book the cheapest available Kotor car and passenger ferry tickets sailing to and from Kotor, Montenegro and Bari with Azzurraline Ferry ferries online with instant confirmation. Book Kotor Ferry Tickets with Azzurraline Ferry for ferries sailing from Kotor to Montenegro and Bari online in advance to enjoy the cheapest available ferry ticket price. The price you see is the price you pay. There are no hidden extras or surprises such as added fuel surcharges or booking fees and we do not charge you anything extra for paying with a Visa Electron card. The price we quote you for your selected Kotor passenger or car ferry ticket, onboard accommodation and vehicle type is all you will pay, and that's a promise. To obtain a Kotor ferry ticket price and book your ferry ticket securely online please use the real time ferry booking form on the left. You are also able to add a hotel at your destination, or anywhere else, to your ferry ticket when completing your ferry ticket reservation. Kotor, located along one of Montenegro's most beautiful bays is Kotor, a city of traders and famous sailors, with many stories to tell. The Old City of Kotor is a well preserved urbanization typical of the middle Ages, built between the 12th and 14th century. Medieval architecture and numerous monuments of cultural heritage have made Kotor a UNESCO listed “World Natural and Historical Heritage Site". Through the entire city the buildings are criss-crossed with narrow streets and squares. One of these squares contains the Cathedral of Saint Tryphon (Sveti Tripun), a monument of Roman culture and one of the most recognizable symbols of the city. The Church of Saint Luke (Sveti Luka) from the 13th century, Church of Saint Ana (Sveta Ana) from the 12th century, Church of Saint Mary (Sveta Marija) from the 13th century, Church of the Healing Mother of God (Gospe od Zdravlja) from the 15th century, the Prince’s Palace from the 17th century and the Napoleon’s Theatre from the 19th century are all treasures that are part of the rich heritage of Kotor. Carnivals and festivals are organized each year to give additional charm to this most beautiful city of the Montenegrin littoral. Since 2001 Azzurraline has been connecting the Italian port of Bari (Puglia region) with the ports of Dubrovnik (Croatia), Kotor (Montenegro) Shenjin and Durres (Albania), with regular departures all over the year, thus creating an ideal bridge over the Adriatic sea, stretching towards the Balkans. In 2001, the shipping company A.S.C. Ltd, owner of the vessel Azzurra – located in La Valletta, Malta – began to foresee great potentialities of development of Southern Italy, and, in particular, of Puglia region towards the Balkans. Thus started ferry connections with Croatia (tourist service, operating every year during summer season from June to September), with Albania (operating all over the year) and with Kotor (Montenegro – very new service). Thanks to Azzurraline, Puglia region is nowadays really closer to the Balkans. Azzurraline, the Maltaise company with italian managment, assures high quality services and standards during the whole journey. Each year Azzurraline transports more than 50.000 passengers and 6.000 vehicles from Bari to the opposite coasts of the Adriatic Sea. The ferry-boat Azzurra connects the Italian port of Bari in Puglia region with the Croatian port of Dubrovnik during summer season, from June to September (110 nautical miles – journey time: 7,5 hrs only), with night-time outward departures (Bari-Dubrovnik) and daytime inward departures (Dubrovnik-Bari). Azzurraline also links the port of Bari to the port of Durres in Albania all over the year (125 nautical miles – journey time: 8,5 hrs). The ferry operates three calls per week, with both outward and inward night-time departures. Finally, since 2005 Azzurraline has also been connecting Bari with the port of Kotor Fjord (Boka Kotorska) in Montenegro. Above service is effective all over the year with 2 calls per week and, always, night-time departures (130 nautical miles – journey time: about 9 hrs). With Azzurraline Croatia, Montenegro and Albania are closer to Puglia. Best Price Guarantee - We always offer you our lowest available Azzurraline Ferry passenger and car ferries ticket price to and from Kotor. There are no hidden extras or surprises such as added fuel surcharges or booking fees and we also we do not charge you anything extra for paying with a Visa Electron card. The price we quote for your selected Kotor ferry ticket, onboard accommodation and vehicle type is all you will pay, and that's a promise! In the unlikely event you find the same all inclusive Kotor ferry ticket cheaper in the brochure of any other tour operator we promise that we will do our best to beat that price or offer you the choice of requesting a refund. 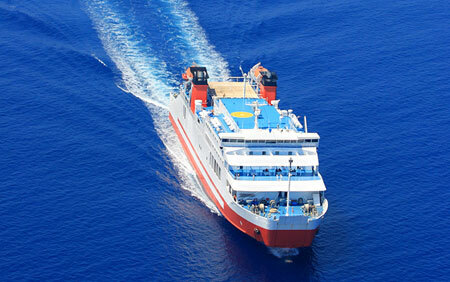 To book Kotor car and passenger ferry tickets please click here. At ferryto.co.uk you are able to obtain live Kotor ferry ticket prices, check availability and book car and passenger ferry tickets to and from Kotor at our lowest available ticket price. Ferryto.co.uk is part of the world's largest online ferry ticket distribution network providing the ability to book over 80 major European ferry operators including to Kotor and to over 1,200 other ferry routes throughout the UK, France, Spain, Ireland, Holland, Eastern Europe, the Mediterranean, the Baltic and North Africa.